House Republicans will huddle privately at noon on Thursday to nominate the party’s candidate to succeed John Boehner as speaker of the U.S. House. Majority Leader Kevin McCarthy, R-Calif., is heavily favored to secure the nomination, but his ultimate victory on the floor of the U.S. House later this month is still in question. The House Freedom Caucus, a group of roughly 40 Republicans representing some of the nation’s most conservative congressional districts, bucked the party leadership and endorsed Rep. Daniel Webster, R-Fla., for speaker on Wednesday. Webster is one of two candidates challenging McCarthy for the gavel. The other is Rep. Jason Chaffetz, R-Utah. “It is clear that our constituents will simply not accept a continuation of the status quo, and that the viability of the Republican Party depends on whether we start listening to our voters and fighting to keep our promises,” the caucus said in a statement announcing its endorsement of Webster. Their endorsement is unlikely to block McCarthy from earning the party’s nomination — but if they hold together — it is be enough votes to deny him the gavel when the full House votes on Oct. 29. A quick math lesson: There are 247 House Republicans, and one GOP delegate from American Samoa who gets to cast a ballot in today’s party election but not on the House floor. Boehner, who is resigning, is expected to abstain from voting in the speaker’s election, which means there are 247 ballots that can be cast today. To win the nomination today, McCarthy will need a simple majority of all lawmakers who are present in the room. Assuming everyone shows up and votes, the winning number is 124 votes. But the speaker is a constitutional officer, not just a party leader, so to formally win the gavel, McCarthy will need a majority of the entire U.S. House when that election occurs October 29. This is where conservatives hope to use their votes to leverage either a different outcome, or at least concessions from McCarthy on how he will run the House. McCarthy can only stand to lose 30 Republicans when the full House votes. Democrats get to cast ballots but the minority party historically votes for their party leader, currently Nancy Pelosi of California, when the vote is called. In other words: this is a Republican fight that needs to be settled with Republican votes. Some conservatives, like Rep. Justin Amash of Michigan, say there is virtually no chance they will support McCarthy for speaker on Oct. 29. But others have left the door open to negotiate, outlining a number of internal changes they’d like to see. At a conservative forum on Wednesday, lawmakers said they’d like to decentralize power from the speaker’s office, loosen rules that govern debate, and change the way party leaders dole out committee assignments. 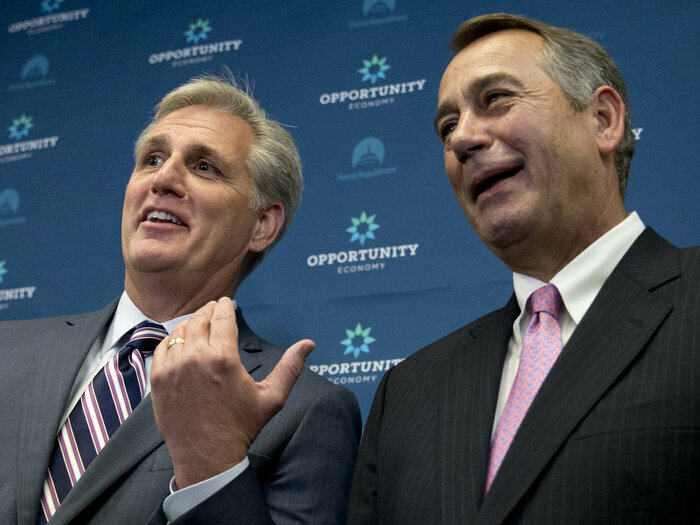 How much power McCarthy is willing to concede may be critical to winning the vote later this month.